Fernhill stair parts are ideally suited for larger, grander staircases in large hallways. This handrail spindle is produced in a choice of Pine, US White Oak, Sapele, Hemlock, Southern Yellow Pine and US White Ash. Grecian Fluted Spindles for stair balustrade and handrails are 900mm to meet regulations. 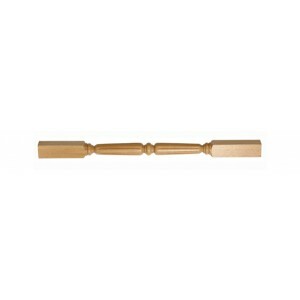 Staircase spindles from the glorious Fernhill range of Traditional staircase parts. Rake spindles help to form the handrails and balustrades on stairs. These spindles provide you with a huge scope for choice as they are made from a top-rate selection of natural timbers and they are produced in a range of different styles from the highly decorative to the simpler, subtle styles.